After I moved away for college, my parents gradually started eating more vegetarian and vegan meals. 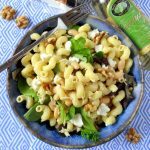 I’m on board with vegetarian and vegan dishes up to a certain point (and you can find a number of them on my blog), but I generally draw the line at fake cheese. I still remember a phone conversation with my dad in which he told me that they had made Philly cheesesteaks for dinner…but that they were vegetarian. Already slightly horrified—I had spent the previous two years living in Philly—I asked, “Please tell me you at least used real cheese?” My dad replied, “Actually, no! We made a vegan ‘cheeze’ sauce.” I started to wonder whether their dietary preferences were an intended method of ensuring that I never moved back in with them. If my parents were in fact trying to deter me from moving back home, that “cheeze” sauce would have actually had the opposite effect, as it turned out. They served mac and “cheeze” the next time I was home on break, and it was by far the best vegan approximation of the dish I’ve ever had. True story: I have requested that mac and “cheeze” for my birthday dinner…twice. I’ve always been wary of fake cheese products (you know, the ones where you know what it’s not made of, but you don’t know what it is made of), but what convinced me that this sauce was worth trying was the fact that it’s made from completely ordinary ingredients: potatoes, carrots, onions, and cashews. Not scary at all, right? 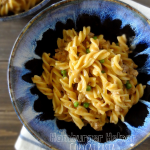 I used this “cheeze” sauce to make a wonderfully creamy dairy-free tuna noodle casserole that is rich in flavor and that totally still feels like comfort food. This is pretty much the best of both worlds as far as I’m concerned, and I’m sure some of you can relate: at times I find myself really craving a comforting, home-y (read: cheesy) dish for dinner, but, because I’m lactose intolerant, if I choose to indulge my hankering, I may end up feeling bloated and icky the next day. Which is obviously super un-fun, but especially if it’s a weekday and I have to be an adult and put on real pants. 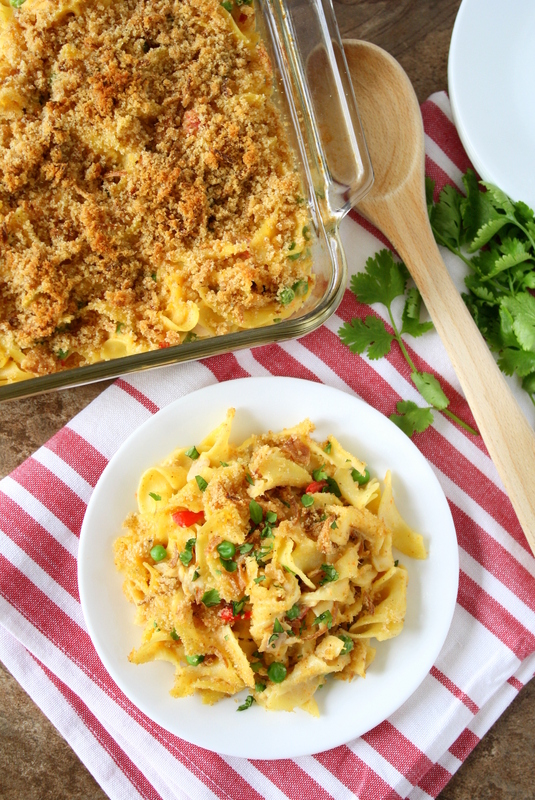 BUT thanks to “cheeze” sauce and this dairy-free tuna noodle casserole, I don’t have to choose between comfort food and pants that fit! I first posted this recipe in August 2013, but since the original photos did not do the dish justice, I decided it was time to take some new ones. The recipe is the same, except that I added some crispy fried onions and chopped cilantro on top. How do you feel about non-dairy cheese? What about vegan Philly cheesesteaks? Preheat the oven to 350 degrees. Lightly grease a 2-quart casserole dish. Prepare the egg noodles according to the directions on package. Set aside. While the noodles are cooking, places the diced potato, carrot, and onion in a saucepan or skillet. Add the water and bring to a boil, then turn down heat and simmer, covered, for 10 minutes or until the vegetables can be easily pierced with a fork. 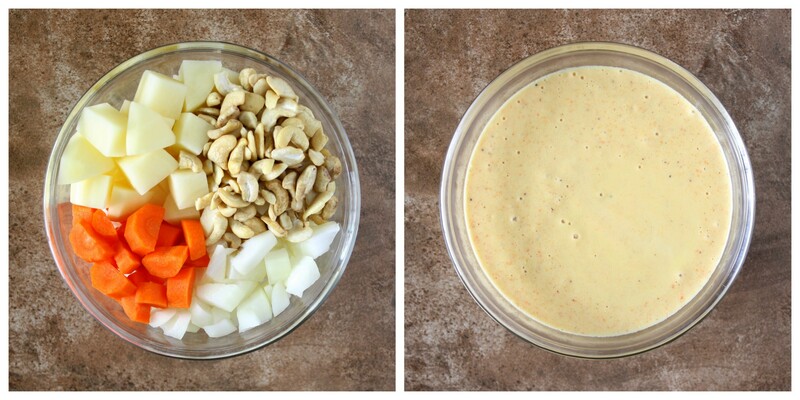 Combine 1/3 cup vegetable oil and the cashews in a blender. Blend until completely smooth. Add the salt, garlic, mustard, lemon juice, pepper, and cayenne. Blend until smooth. Carefully transfer the cooked vegetables (along with the water) into the blender. Blend until smooth. Mix the sauce with the cooked pasta. Stir in the tuna, peas, and pimentos. Pour into the prepared casserole dish. In a small bowl, mix the bread crumbs with 2 teaspoons olive oil. Stir in the crispy fried onions and scatter over the pasta. Bake for 15-20 minutes or until the topping is golden brown. Optional: sprinkle chopped cilantro on top of individual portions. Sauce recipe adapted from Quick and Easy Vegan Comfort Food. Great post! Such an interesting sauce. I remember sampling all of the faux cheeses, just as options, but they are pretty terrible. Especially if you’re somewhat of a cheese snob. I had to draw the line at tempeh and faux meat. Great recipe! Thanks! I completely agree – it’s SO tough to find a cheese substitute if you’re a cheese snob! I don’t know if I’ve ever tried tempeh, but I don’t love tofu…so I’m guessing I wouldn’t be too keen on tempeh, either. Thanks, Debbie! I hope you get a chance to try it. I’m totally intrigued with this recipe! 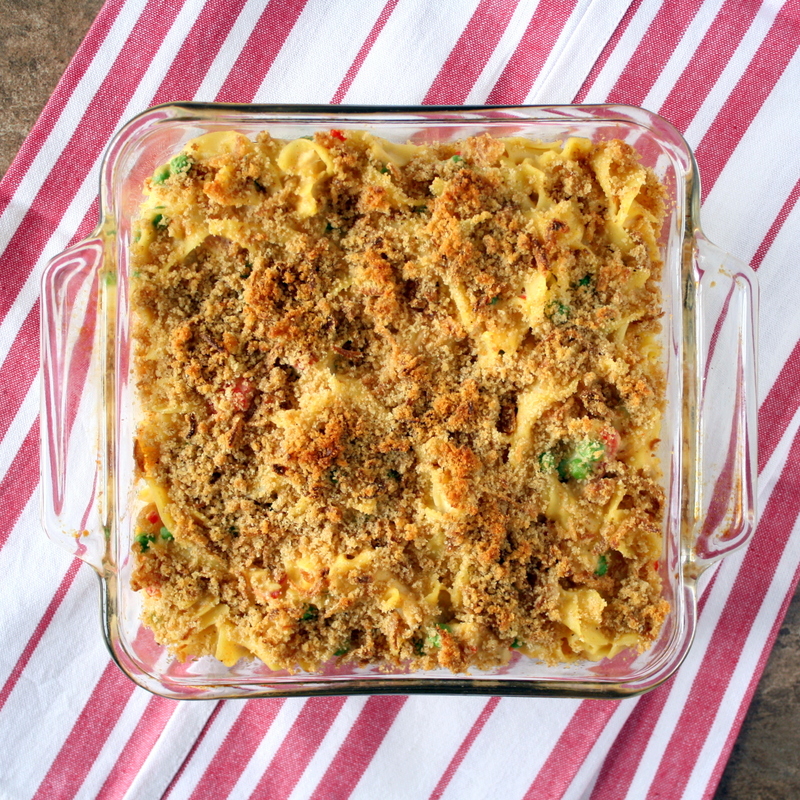 My mom would always make tuna noodle casserole when I was growing up. I actually really do love it, but never thought about making it dairy-free?! I hadn’t thought about trying to make it dairy-free either, until I found my parents showed me this “cheeze” sauce recipe. It’s really fantastic! Quick question: dry mustard or prepared mustard in the sauce? Which do you prefer? Thanks for reminding me of this great satisfying recipe! Good question! The amount listed is for prepared mustard. If you want to use dry mustard, I would use about 1/8 teaspoon. I usually use prepared mustard, since that’s what we have on hand for sandwiches and stuff. I hope you get a chance to try this! We had this very satisfying casserole for dinner last night. The recipe doubles easily. It may have been the BEST tuna noodle casserole I have ever eaten. Thanks again!! Interesting sauce! 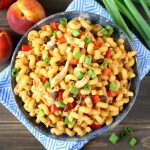 I have not heard of using potatoes and carrots in a faux cheese sauce (I have tried cashews for it)–this looks really interesting and definitely worth a try! Looks delicious! 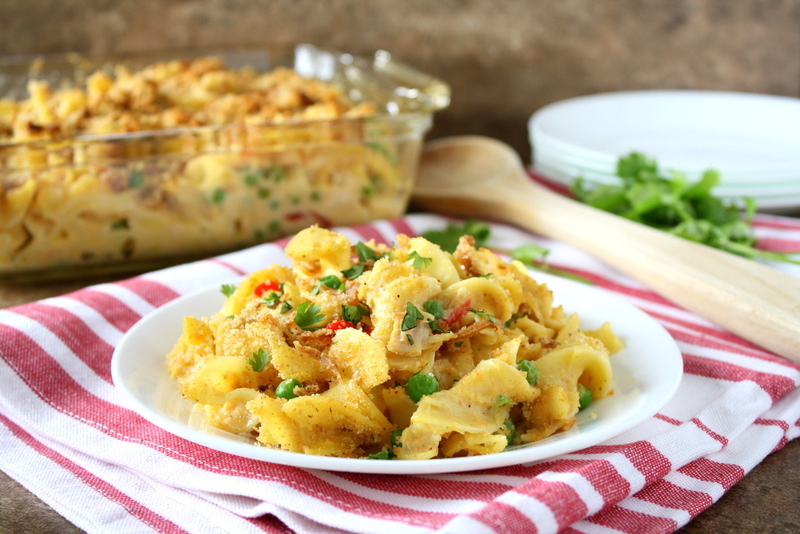 Tuna noodle casserole is SUCH a comfort food for me! I love that this one isn’t overly creamy, either. I want to make some for dinner soon! Oh definitely, some casseroles are downright soupy. Thankfully this isn’t one of them! Thanks for stopping by, Jenna! I completely understand your hesitation. I was pretty iffy about trying the sauce for the first time but I was quickly won over…and I say that as someone who loves cheese a ridiculous (and possibly unhealthy) amount! And no, I have no plans to move back in with my parents, although it would be wonderful to move back closer to them! Oh good, I’m happy that this post came at a good time for you. I hope you get a chance to try this! I loved this dish as a kid! I am so curious to try the cheeze sauce! Mind blown! PS. What does he use to make the steak in the philly’s? And if it’s tofu does he slice it thin to resemble the meat? Haha yes, I agree, my mind was blown the first time I tried this sauce – let me know what you think if you try it! And as for the “steak” in the Philly cheesesteaks, he used seitan. He says he sliced it thin and then pan-fried it to give it a pseudo-grilled feel. Thanks! I need to try more vegetarian options. I love meat so it’s hard! This is seriously one of the ultimate comfort foods for me – and I bet it would be for you as well! I hope you get a chance to try it. Thanks for stopping by, Sarah! Whaaat?! Dairy-free?! Are you sure about this?! Okay, I’m going to trust you 😄 I can actually make this tonight; I have all the ingredients and I’ve been looking for ways to use up the raw cashews. Thanks! I love that I am not the only one who redoes a recipe to get a better photo! 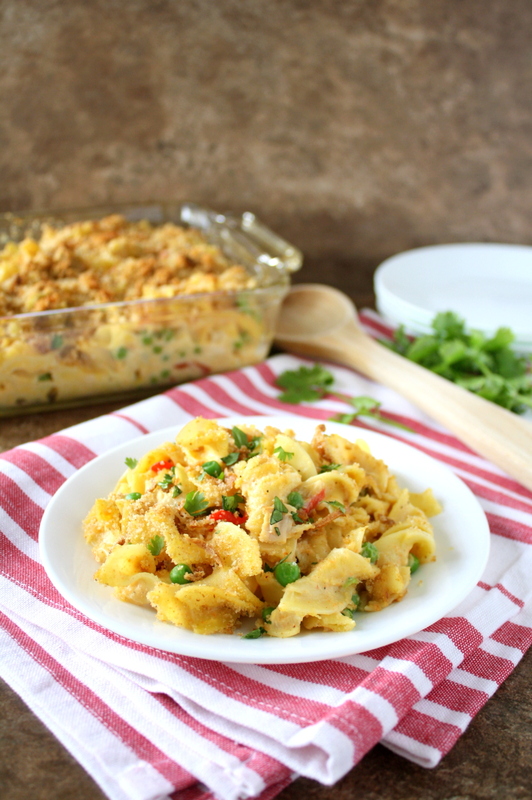 This dish looks wonderful…non real cheese sauce and all! This looks great, Mara! 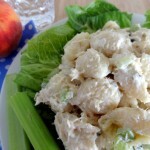 This photo revamp of your recipe looks fantastic!! And I’m right there with ya on the day-after-eating-things-your-stomach-despises feels. Whenever I eat french fries or mashed potatoes, I am hard pressed to find a pair of pants that I can button comfortably without wanted to crawl back immediately to seek refuge in my cozy sweatpants!! Oh believe me, I love cheese a *ridiculous* amount, but this dish actually does the trick when I’m in the mood for something cheesy! I can definitely see why people would be skeptical, though. I hope you get a chance to try this – you’ll be glad you did! My husband is allergic to cashews…any other nut suggestions? This looks delicious! I’m dairy-free because I’m breastfeeding…and I miss cheese! So much! Thanks, Katie! The original recipe from which I adapted the sauce calls for 1 part cashews and 1 part macadamia nuts. I use all cashews since macadamia nuts are more expensive, but I imagine that you could just as easily use all macadamia nuts instead. Let me know how it turns out if you try it! Ok so I have to say that I was EXTREMELY skeptical of this faux cheese sauce…..until I tried it. I was absolutely shocked at how good this sauce turned out. I love cheese and really didn’t have much hope that this would be any good. I used shredded chicken instead of tuna and this turned out so yummy! My husband loved it too! Thanks for sharing this great recipe! Hi Jules! I’m so glad to hear that you and your husband enjoyed this – and that the sauce turned a skeptic into a fan (which is exactly what it did to me, too!). Thank you for taking the time to report back! The cheez sauce was amazing! My son has a dairy allergy so me and my husband have gone dairy free as well. I’ve tried many faux cheeses and this is great! I added a little almond milk to thin it out a little and a vegan chicken bouillon cube, I also used 1/8 tsp I’d dry mustard and used veggie Broth. Thank you for a great recipe! For the raw cashews, do you just put in dry cashews? Or do they have to be soaked over night to be able to blend together? I just put them in dry, straight from the package. It may take a minute or two to blend them fully, but this way, you don’t need to prepare as far in advance to make the recipe. Let me know what you think if you make this!